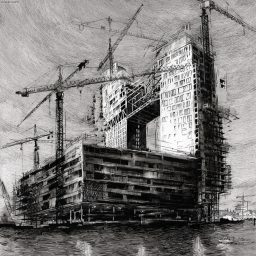 With this drawing I want to start a crowdfunding initiative! I’m looking for support for my line-art on patreon, with variations and projects around the general idea. 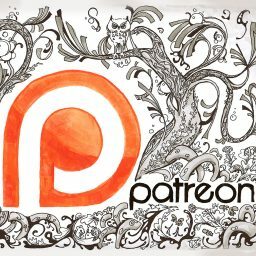 Patreon is basically kickstarter, with the supporters not paying once, but smaller amounts. Either per finished artwork or per month (what I’m going with). 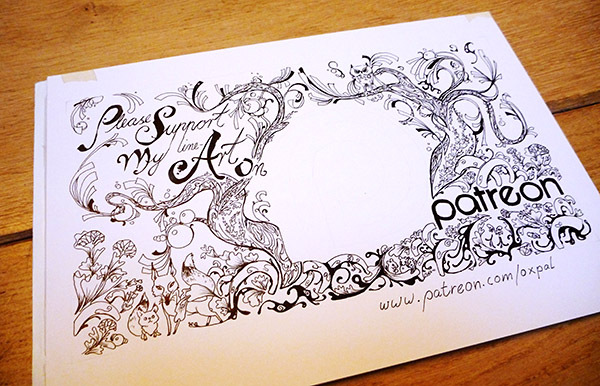 I’ve posted all the details on my patreon art page. Your your impression of the pitch or input and ideas would be welcome – and of course any support if you like to see more of this. 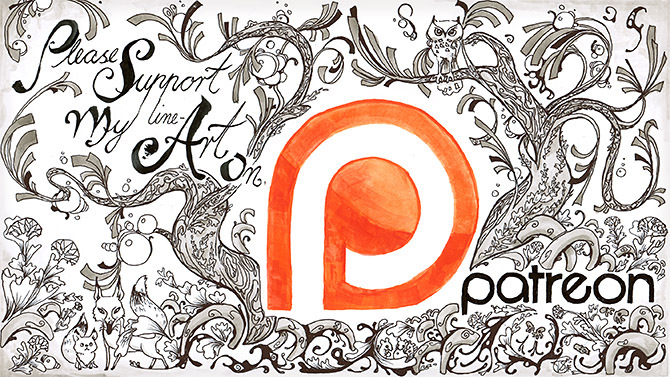 The patreon header – made with Ink, Markers and Watercolor on Bristol paper. I’ll make the high res a patreon exclusive. I really like patreon’s approach. It seems to me more fair than kickstarter, where backers can only hope to get a result maybe years later. This way you see the progress and can stop anytime. It also makes a lot of sense for me as artist – people are used to consume digitally and don’t necessarily need big originals to fill their walls. Even I personally don’t buy big original artworks. But I think people still like to support artists. So I’m hoping this concept takes off. As usual I kinda overdid it, and added some little calligraphy for the headlines and drawings for the rewards… here are some pics of it. The sheet when working on the headlines. 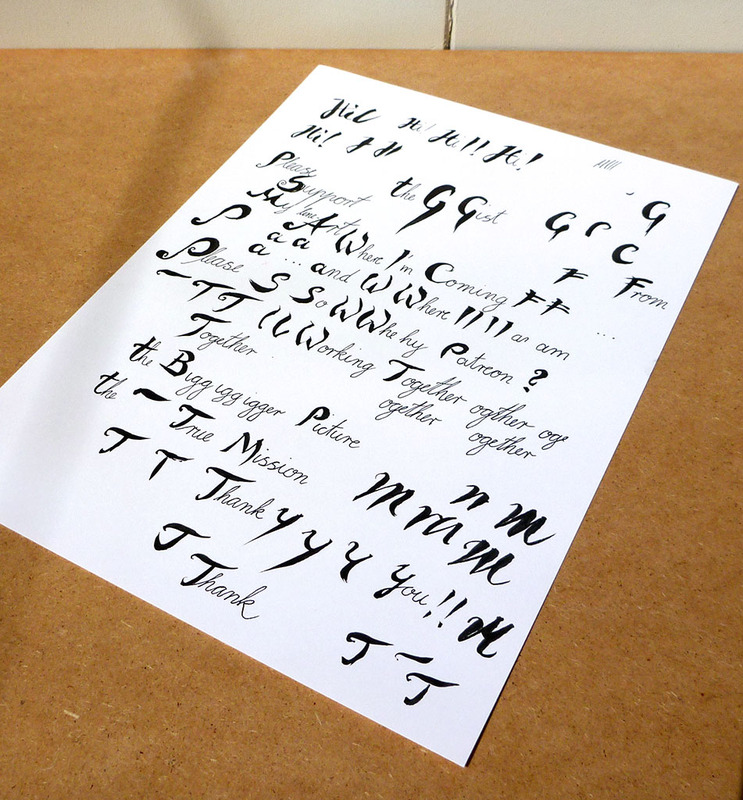 All images and lettering was done on paper (with some small tweaking later). I wanted to stay in the topic that I promise for the campaign. 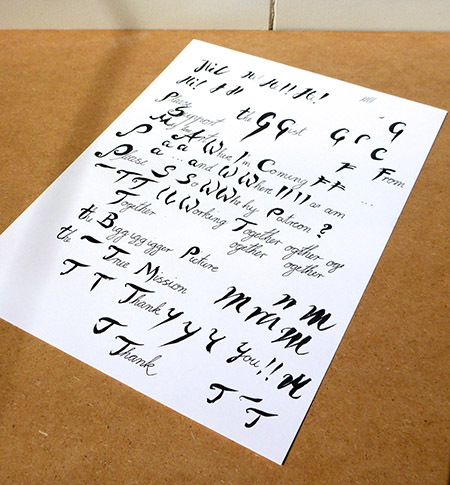 Here is the line-art step, before I added the letter with watercolor. 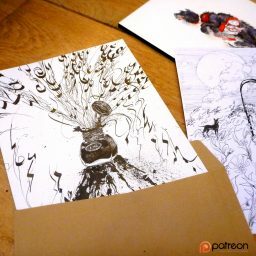 The high resolution of the artwork is a patreon reward – as is a preview of my current bigger ink artwork. And as soon as I reach the 5 dollar milestone, I’ll post the final one.